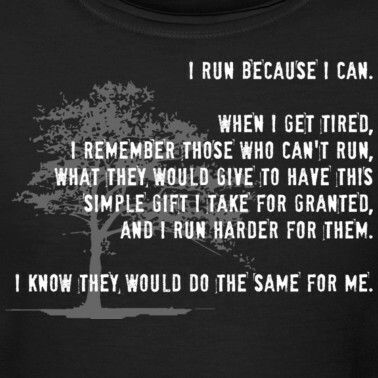 Running is such a mental game for me. And I know to some extent, running is a mental game just by nature of the beast. It just is. Sometimes I just feel like it’s more of a mental game for me than it should be and something I should have kicked to the curb in the 18 weeks of this run-challenge of mine. But then I realize that even the most seasoned runner still has days where the mind doesn’t quit and in enters the mental game. And I realize that even if I might have a more mentally challenging run than I’d like, it’s usually 1 out of every 5-6 runs and not every single one. For example, my run with my sister a couple of Fridays ago? The complete opposite of mental. It was utter perfection. But at the other end of the spectrum? Enter today’s run. Today’s run defined mental game. I was initially planning a rundate with my sister this afternoon but she’s trying to fight the ‘notsick’ vibes and opted not to run (good girl!!) and just come over for dinner (on tap, btw? THIS lentil recipe. Another lentil kick!!). In came the self-doubt. Running alone. Something I’ve lately had limited success with. I probably shot myself in the foot by even allowing myself to let that self-doubt creep in. The fear of not running well alone, since the last few times I’ve done solo runs outside have been meh. And just like a self-fulfilling prophecy, it was a meh run. Started out great. Warmer than I thought (definitely wore a too-thick shirt!). Less windy than I thought (I have developed a fear of running in the wind of late, wtf is up with that?). Speedier than I thought. And then about a mile in, I stopped to take off aforementioned too-thick shirt and my calf started to bother me. And that pain never ceased. And my breathing was up and down, more labored than I thought. And then I had to stop again to stretch my stupid calf. And the run just felt like it went to hell in a handbasket (another wtf – why am I using that phrase lately?!) from there (yet the last mile or so I finally felt like I hit my stride). So, yeah, I did it. I ran outside by myself. I forced myself onward. But I fought the mental game the entire time. I worried that if I am having a bad run now by myself outside, how am I going to do more of these? And is it because I am alone or because I am going through another streak of ‘meh’ runs? Or am I just jumping to conclusions? OR is it my new sneakers? (still debating that one. I got fitted for these and they feel great, yet, when I run in them, the soles of my feet start to hurt after awhile. Not normal? Must try running with my old pair and see if it still happens…). Does this happen to anyone else or am I in the minority? I just get so frustrated when I have one of these runs because I want to progress and grow and continue to gain strength and speed and…confidence. I’m hoping it’s just one of those days. And I ran. And that’s all that matters. I can run. And I did. Overthinking Ollie hasn’t made an appearance in quite some time. For that, I am extremely proud. (especially as kicking that overthinking tailspin came at the exact right time in my life, because I was heading down a very ugly path in my head, otherwise). But that doesn’t mean she doesn’t rear her ugly head now and again and I have to tamp it down ever so gently (yet firmly). You see, overthinking leads to negativity. Overthinking leads to going for the field goal, and not the touchdown. Overthinking leads to comparison, fear and losing trust and faith. All of these things I have worked so hard to quell and have honestly conquered pretty damn well, I do believe. But sometimes, overthinking rears its ugly head and I need to remind myself just how far I’ve come. In life, love, my job, and my body. Harness that, and not the negative, questioning, comparing that can be so ugly. This is me reminding myself to keep that overthinking Ollie at bay. Cuz I got this. PS check out this fantastic article from Emma…she interviewed me for the article and I am so proud of how it came out. Thank you for the opportunity to share my story and how I harnessed my divorce to turn it into an experience that shapes me to this day. When Overachievers Divorce. Edited: WordPress.com made changes to commenting, out of the author’s control. If you have a WordPress account tied to the e-mail address you’re using to comment (even if it’s old, or one you don’t use), you mustsign in with that account to comment. Otherwise, just use a different e-mail? Or make one up. Frustrating and an extra step, but it seems to be the only thing that is working! I have always struggled with this. Letting go. I think it’s been the root of my anxiety and overthinking ways (of the past!) and the inhibitor to growth and adjusting to change, in some capacity. When I moved in with M in August, I started to let go a little bit. It took time, and it was frustrating, but I’ve let go of things like a spare dish in the sink, socks on the floor, whatever it may be, and have accepted that we are different people with different habits and allowing the house to not look as perfect as I’d like sometimes is perfectly okay. I used to get so anxious about it (moreso in my past apartment) in keeping it in tip top shape all the time and sticking to my once a week top to bottom cleaning, and while I do strive for a clean and tidy place now, I’ve realized that a few socks or papers laying on the table won’t kill me. Learning to let go in this capacity has actually really helped me let go in other ways, too. Like with my routine and my workouts. I am better at adjusting my workouts to the conditions around me (as evidenced by last week’s workouts) and working out smarter, not harder, and the biggest one? Running. Letting go and not being so anxious or nervous prior to starting a run has done wonders for me. I have also learned that letting go means not comparing and not tearing myself down mentally, either. These will always be areas I need to work on, sometimes everyday, even, but instead of allowing fear to drive me or even competitiveness, to an extent, I am becoming more and more content with the me that I am, regardless of what others might think or assume about me, my relationship or my actions. That’s been huge for me. The barre n9ne 60 day challenge has been, by far, one of the biggest tests for me in terms of letting go. It sounds like an oxymoron, in a sense, since this challenge has been all about focus, determination, dedication and being relatively strict with my eating and workout habits, but it has also meant throwing the rules out of the window and dedicating myself, mind, body and soul to this approach. It was really scary at first. It went against much of what I’d done in the past. But now? I can’t even fathom anything different. I can’t even fathom a better approach for me. One that works. From the eating habits and food log to the style of workout, to the combination with running that has been my special sauce. Letting go and not ‘going halfway and then stopping‘ has proved to me that dedication and hard work are, quite simply, all you need. There are areas that I still have plenty of work to do in terms of letting go. A challenge coming up that I hope to be able to share with you soon (that is very, very exciting and I am bursting at the seams waiting to share it!) 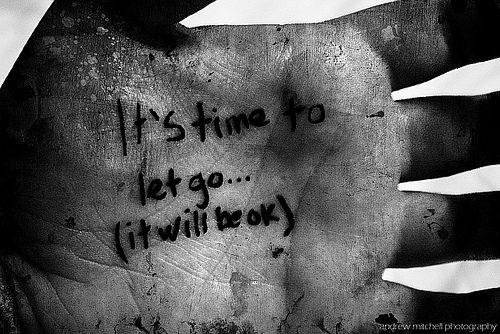 will be a true test of letting go. Of throwing some inhibitions out of the window and just going for it. I know I can do it, I just have to apply what I have learned and dedicate the time and focus to it. This post literally came to me this morning as I was making my breakfast…and it’s actually given me a lot of food for thought in how I can apply this to all aspects of my life. Because letting go has been what has helped me change, grow and develop into who I am now. And I couldn’t be happier. Stories that define me: facing fears. 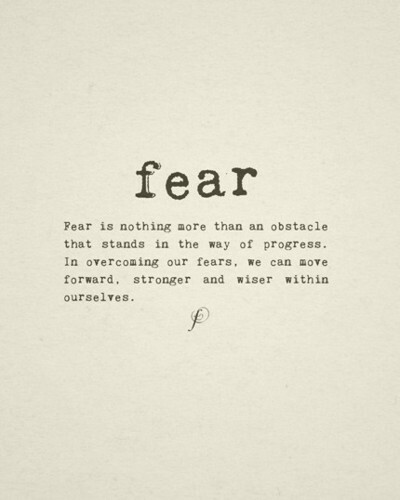 I think fear is largely innate…and maybe that’s just my opinion because of the observations I’m about to share. But think about it…I don’t know anyone that was born fearless. I think facing and overcoming fears is a learned trait and one that everyone has to overcome in their lives at least once, or maybe over and over again until they see fear as a propeller towards growth rather than a paralysis mechanism. Growing up, one of my biggest ‘innate’ fears was being alone and doing things alone (I touched on this in one of my last posts in this series). I firmly believe this innate fear for me is because I never had to do anything alone. I always had my sisters. We experienced every ‘first’ together during childhood and adolescence, for the most part. Moving away from the pack was unnatural for me and well, scary. Enter fear. For me, fear meant being shy. It also meant sticking with the status quo. And that meant never sticking my neck out there or making decisions that were different from what my sisters did or different from what I was comfortable with. Enter comfort zone. See, fear and comfort zone are so closely tied together for me, it’s ridiculous. (and I realize that this isn’t a unique fear or finding…I am sure this may be more normal for many, but looking back at my patterns is really helping me continue to break out of comfort zones and unseat them more). 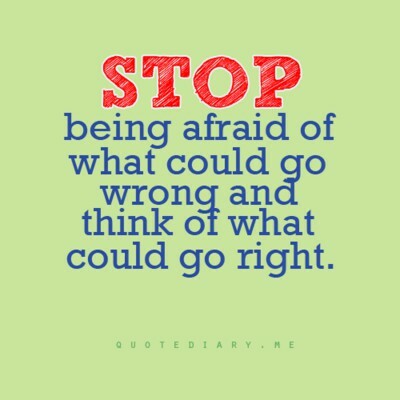 And once I am stuck in my comfort zone, it’s really REALLY hard to climb out and decide to do something different. While I’d love to say that my divorce helped me face fears more than anything else, that wasn’t a decision…it was forced upon me to cope with. That first year of separation and living alone and facing all sorts of fears was not by choice, it was not something I ever would have done on my own. And not to diss my own growth or discount what I went through, facing fears during that time was involuntary…but looking back, it really made me realize just how many fears I had and how many were so deeply seated. Living alone. BEING alone. Doing things independently. Taking chances, risks, trying new things. All foreign concepts to me. So while I faced my fears during this time, what I faced more was just how comfortable I’d gotten in my little nook of comfort and how little I was actually growing. I think fear, fear of change, routine and being in a comfort zone were contributing factors to my divorce, unbeknownst to me until…now. I firmly see that more than I ever did before. And it makes me more thankful for where I am today in my life. I think that the ultimate change for me, in facing my fears head-on rather than pushing them aside for sake of the status quo and comfort zone, was starting my job. And not just any job. But a job halfway across the country. A job that would force me to be more verbal, present myself more confidently, and prove myself. A job that would also allow me to hone the skills I’d cultivated for the past 8 years at my previous job (8 years PLUS…talk about comfort zones!!) and learn new ones. Teach myself more about the areas I consider myself weak in. ASK QUESTIONS. <<-for some reason, I have always been afraid of asking questions for fear of sounding stupid…but ya know what? if I don’t ask the question and try to fake it, that usually backfires more than just asking the damn question. Truth. A lesson I learn all the time, over and over again. Taking this job was sort of the seachange moment for me…where things all of a sudden felt just a little bit less scary. Traveling alone. Being alone. Standing up in front of people alone. (notice a theme here…being ALONE!). alonealonealone. This is what has allowed me to face my fears. Doing it by myself. Alone. Sometimes because I have to, but other times because I choose to. And on days where I feel that shyness creeping back up (today, for example, as I face a few meetings and things I need to do on my own as my boss is on vacation…it’s those fearful moments I had for almost the entire three-month maternity leave she had, where I was forced to ACT and BE and DO…but I did it then, and I can do it now, right?! ), and that fear driving me away from what I need to do, instead of towards it, I am going to harness the fear for good and ACT and BE and DO all over again. Because that’s how I roll now…I face fear. I use it to motivate, not paralyze. It’s an everyday process and an everyday learning cycle for me, but for me, facing fears has been more rewarding than almost anything I can think of to equate it to. How about you? Are you good at facing fears? Do you instinctively shy away from it? What have you learned from your own patterns when it comes to fear?